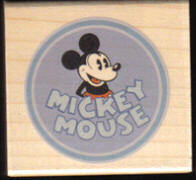 Description: This stamp by All Night Media is titled: Mickey Ta Da #540-F02. So cute for your handmade cards. Description: This is a wonderful stamp made by All Night Media. From the Disney licensed line of wood mounted stamps. This is Friendly Donald!! Description: This is a tub filled with 9 different mini stamps and 1 mini ink pad in Red. Called Mickey & Minnie, you get stamps of Mickey's face, Minnie's face, Mickey's Shorts, Minnie's Purse, A Flower, Heart Confetti, Mickey's Hand, A Star and A Silhouette of Mickey's Face. Made by All Night Media and so cute for making Birthday Cards and Invitations!! All stamps and ink pad come in a plastic tub with a lid for easy storing!! Description: This is Minnie's Face from All Night Media and the Disney collection. Cute when used with the matching Mickey's Face also sold here!! 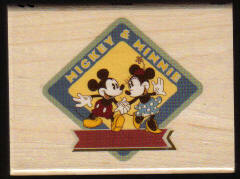 Description: This stamp by All Night Media is titled: Mickey Loves Minnie #540-J02. So cute for cards and scrapbooks. Description: This border stamp comes from All Night Media. It is just the right size to outline the front of greeting cards. Use it also to frame your favorite pictures from your visit to Disneyland. Description: This stamp comes from All Night Media. It is a scene from 1930's disney cartoon. This is classic Retro Mickey. The paper in Mickey's hand and the conversation bubble above him are blank so you can write in what you want. This one is too cute! Size: Image is 3" X 3"
Description: This stamp comes from All Night Media. Mickey and Minnie holding hands and walking is inside a diamond shape frame with their names. The ribbon across the bottom is blank for you to fill in the name of someone special. Personalize this cute badge to use as embellishment to photo albums, scrapbooks and greeting cards. Size: Image size is 2 1/2" X 2 1/4"
Description: This stamp comes from All Night Media. 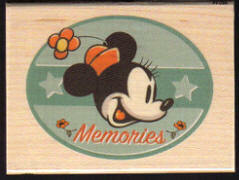 Retro Minnie's face is shown here in a circle badge with the word "Memories". Cut this out and layer (or pop up)on your photo albums, scrapbook memory pages or even embellish a photo frame. This is a nice size stamp that gives that Disney touch. Size: Image size is 2 3/4" X 2"
Description: This stamp is from All Night Media. 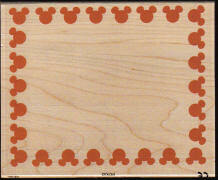 It is a very useful Retro Mickey Mouse border stamp to outline your Disney projects, greeting cards and scrapbook pages. This smiling Mickey border is very cute! Description: This stamp is from All Night Media. Retro Mickey Mouse with vintage Mickey lettering inside a circle frame. You can use pop dots to make this badge pop out on your Disney creations. This one is a classic! Size: Each stamp is 3?4" X 3/4"
Description: Very cute stamp from All Night Media called Sneaky Tigger. Kids and adults love Tigger and here he is in all his "Sneakyness". Size: Stamped image is 1" X 3 1/4"
Description: This stamp is called "Somebody Special" and is from All Night Media. 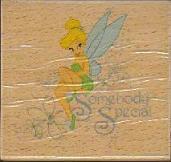 It features Tinkerbell, flowers, fairy dust and the words "Somebody Special" This is a large stamp great for greeting cards! These normally retail for $11.00 but since there are wrinkles in the plastic picture label, I'm reducing the price dramatically. The rubber stamp itself is in great condition. Size: Stamped image is 2 1/2" X 3"
Clearance: Great price! Order as many as you like! 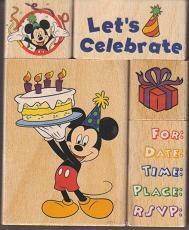 Description: This is a wonderful stamp made by All Night Media and part of the Disney Collection. Small Eeyore is a wonderful image of Eeyore sitting alone and looking back. 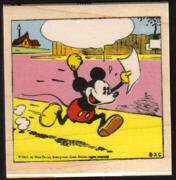 Size: Stamped image is 1" X 1"
Description: EK SUCCESS-Clear Stamps: Disney's Mickey and Minnie. Easy to use; easy to clean and even easier to store! These fabulous clear stamps of Mickey and Minnie is signature poses along with trademark images and AW SHUCKS; OH BOY! and MAGIC titles. Character stamps measure approximately 2-1/2 inches tall. Package contains twelve stamps. Requires acrylick block sold separately. So easy to use... just peel them off the clear backer sheet and position them on a clear acrylic block. Once you are done stamping, clean the stamps and let them dry. Return your stamps to the clear backer sheet for storage.